•	New photography show explores the reach of homelessness in London. 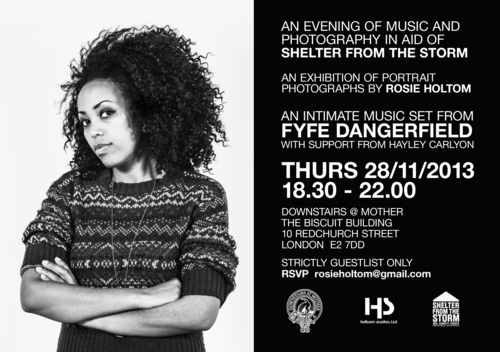 On Sunday 24th November, a new photography exhibition will open downstairs at Mother featuring a series of portrait photographs of residents at Shelter from the Storm, a night shelter in North London. The photographs will shock many viewers, as they are the antithesis of the gritty images of rough sleepers with which we are bombarded in the run up to Christmas. They show a diverse group of people, many of them young, bright and beautiful, exploring the reach of the problem in the capital. Many of them have jobs, or are desperately seeking work, and simply cannot afford the capitals rising rent prices. We are London's ONLY free homeless shelter, open all year round and we receive no help from the government. We are not affiliated with any other organisation and we depend on volunteers from the community. We rely entirely on generous donations to survive, anything you give is used purely to keep offering our services to those who need them.